Home / Blog / Uncategorized / High-tech MDX-1 Shredding Vehicle Joins the Fleet – Second in Europe! High-tech MDX-1 Shredding Vehicle Joins the Fleet – Second in Europe! 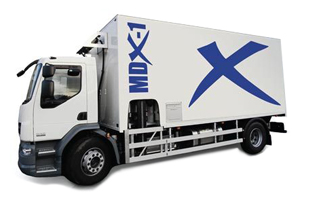 Shred Station is pleased to announce the addition of a brand new MDX-1 shredding lorry to its transport fleet. The top-level security vehicle, branded with a Union Jack flag will help to support the increasing customer base and assist with the steadfast waste disposal service we provide for our clients. Designed and manufactured by Canadian company Shred-Tech, the revolutionary new vehicle allows us to shred up to 3,000kg per hour in accordance with the European Standard and 1,150kg in high security mode. Shred-Tech’s MDX-1GT vehicle was launched at the NAID Europe PRISM Conference in London, an event organised by the international trade association for companies providing information destruction services.